Logitech today introduced two new folios to its lineup of products for the iPad mini with the Logitech Ultrathin Keyboard Folio for iPad mini and Logitech Folio Protective Case for iPad mini. Designed with the mobility of the iPad mini in mind, both of these folios are precision-engineered with state-of-the-art materials, resulting in cases that are ultra-thin and ultra-light, yet protective. Additionally, the Logitech Ultrathin Keyboard Folio for iPad mini features a built-in keyboard for a fast and fluid typing experience. The Logitech Ultrathin Keyboard Folio for iPad mini includes a Bluetooth keyboard. The Logitech Ultrathin Keyboard Folio for iPad mini is expected to be available in the U.S., Europe and in select countries in Asia beginning in August, 2013, for a suggested retail price of $89.99. 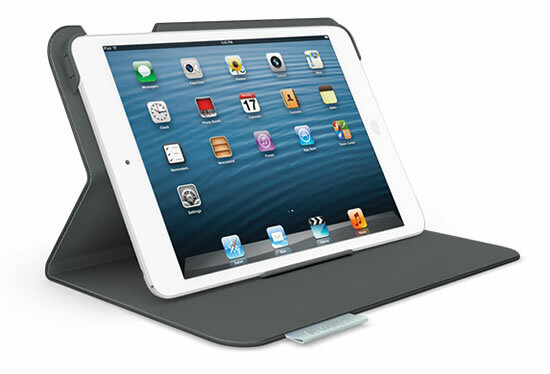 The Logitech Folio for iPad mini is expected to be available in the U.S., Europe and in select countries in Asia beginning in August, 2013, for a suggested retail price of $49.99.